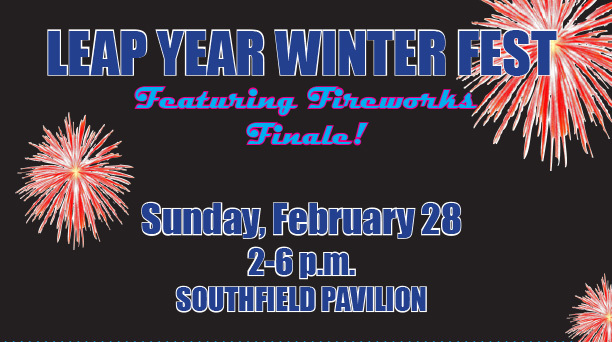 (SOUTHFIELD, Mich.) – The city of Southfield will host the Leap Year Winter Fest featuring a spectacular fireworks finale on Sunday, February 28 from 2-6 p.m. in the Southfield Pavilion located in the Municipal Complex at 26000 Evergreen Road. This free community event will feature an afternoon of food, fun and fireworks for the whole family, including: children’s games and crafts, inflatable obstacle course and moonwalk, Rosco the Clown, the Southfield Fire Department’s Fire Safety House as well as ice and wood carving demonstrations. The afternoon will top off with a special winter fireworks finale at 6:30 p.m. The event will also feature food available for purchase as well as free admission and parking. For more information, contact Southfield Parks & Recreation at (248) 796-4620 or visit www.cityofsouthfield.com.